Two members of Sewage Treatment Workers and Sr. Sewage Treatment Workers Local 1320 monitor operations at a sewage treatment plant. The ranks of Local 1320 declined after the Dept. of Environmental Protection brought in a multinational water management profiteer as a consultant. Photo by Clarence Elie-Rivera. Veolia, the giant conglomerate that gave a clean bill of health to the poisoned water supply in Flint, Michigan, has for years drained New York City of millions of taxpayer dollars, critics charge. And with its hefty city contract set to expire in June, opponents of outsourcing public services are set to battle with Veolia, a $27 billion company based in Paris, over the future of how New York City manages its wastewater treatment system. “We urge the city to not renew, extend or issue new contracts to run any part of New York’s public wastewater system with Veolia — or any for-profit management company,” said Jim Tucciarelli, president of Sewage Treatment and Senior Sewage Treatment Workers Local 1320, whose members operate the Dept. of Environmental Protection’s 14 wastewater treatment plants and collections facilities. Since 2011, New York City has paid Veolia as much as $60 million to oversee DEP’s wastewater system. The contract has two one-year extensions pending. The global water industry is a rich $400 billion pool that Veolia wants to dive in. Veolia leverages management of New York City’s renowned wastewater system to woo officials in other cities. Recent press reports on the tragedy in Flint — where residents’ complaints of contaminated water went unanswered for two years, even as serious illnesses spread through the small, impoverished city — revealed the state of Michigan paid Veolia $50,000 in March 2015 to test the water. Veolia recommended water softeners for iron corrosion but failed to expose deadly lead contamination, because “it was not in the scope of the contract,” their press release said. Leading New York City to Veolia like a horse to water was Stephen Goldsmith, a deputy mayor in the Bloomberg administration. A public-private partnership guru, Goldsmith, a former Indianapolis mayor, brought in for-profit Veolia and consultant McKinsey and Co. to supervise DEP in 2011. Indianapolis contracted its water system to Veolia in a $1.5 billion, 20-year deal in 2002. Veolia amended the contract in 2007 to add $144 million in charges and shift liabilities to the city. Realizing it couldn’t pay, Indianapolis washed its hands of Veolia in 2010 and paid Veolia a $29 million termination fee. Veolia began supervising DEP operations under a one-year, $4 million contract that the New York City Municipal Water Finance Authority approved with no public scrutiny. DEP and the water board hired 26 Veolia consultants and subcontractors, including six chief project managers. They are provided office space, cell phones and computers. They track and mirror civil servants’ tasks. They remain at DEP as part of Phase 2 for $32 million. Additionally, New York City pays Veolia a fixed fee of 25 percent, or about $14 million dollars, for reaching its savings targets. Local 1320 President Jim Tucciarelli says deep staff cuts at the Dept. of Environmental Protection, where the multinational water management company Veolia oversees operations, are jeopardizing the worker safety and threatening the environment. Photo by Clarence Elie-Rivera. To shrink DEP’s $1.2 billion annual overhead, Veolia slashed the headcount of Local 1320 skilled workers, limited maintenance and repairs, and sold off DEP vehicles and properties. Veolia’s plan cut unionized jobs that protect the wastewater system, Tucciarelli said. Local 1320 members routinely test water ensuring it meets federal standards. They undergo training for Fire Dept. certificates of fitness to handle dangerous chemicals used in wastewater treatment. 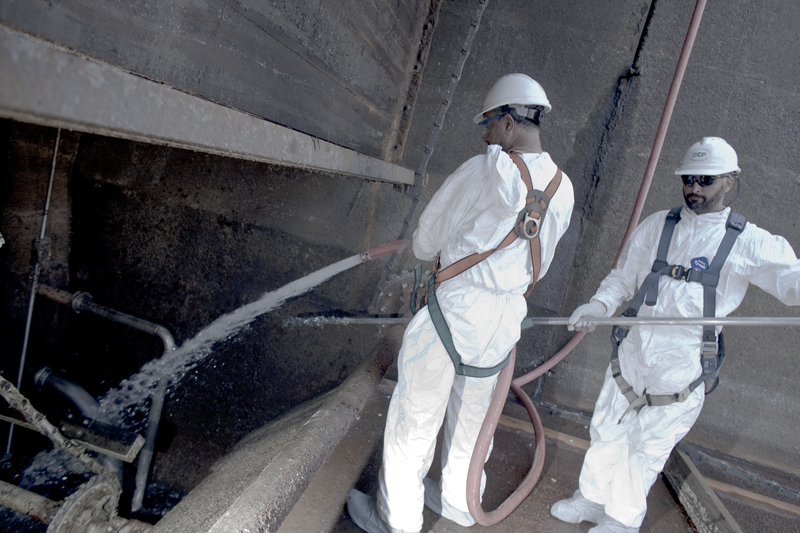 Under Veolia, DEP wastewater treatment plants are down 120 sewage treatment workers, or 20 percent. “Deep staff cuts have DEP running a bare-bones operation that jeopardizes workers’ safety and the environment,” Tucciarelli said. DEP runs redundant operating systems and when equipment breaks, STWs and their Supervisors make sure the back-up kicks in. They routinely repair and test waters in deep tanks throughout the process using a buddy system and a top man for safety protocol when entering these confined spaces, Tucciarelli explained. “Veolia skirts this practice and admonishes us for it,” he said. Veolia’s murky environmental record stretches beyond Flint. Globalexchange.org lists more than 18 contracts that ended as raw deals for residents. It exposes Veolia’s ties to bribery scandals, chemical explosions, sewage spills and soaring water rate hikes. Veolia’s promises rang hollow in Rockland County, N.Y., Camden, N.J., Atlanta, Ga., and Stockton, Ca., and in cities in Europe, Israel, Africa and China. Even in its home Paris, France, the mayor severed all ties with Veolia, finding that “cities with the cheapest water rates were nearly all run by public bodies, while the most expensive were mainly run by Veolia,” a 2013 French study said. A grassroots Dump Veolia campaign kept the profiteer out of St. Louis, Mo., in 2012. Similar campaigns blocked Veolia from Baltimore and Boston. More than 180 cities here and abroad have ended contracts with for-profit firms like Veolia to return the most precious commodity — water — to public control.